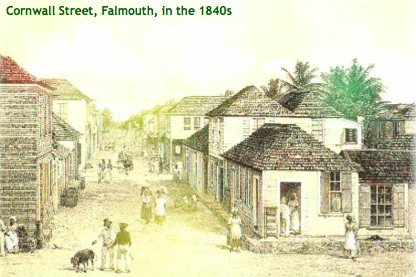 Twenty-five or thirty years ago the town of Falmouth was falling to ruin, but had not yet reached its present position of desertion, desolation and distress. Its people were leaving it even then; one by one its houses were being shut up, never again to be opened; its trade had dwindled, the planters who rode into town grew fewer steadily, as estate after estate closed down. 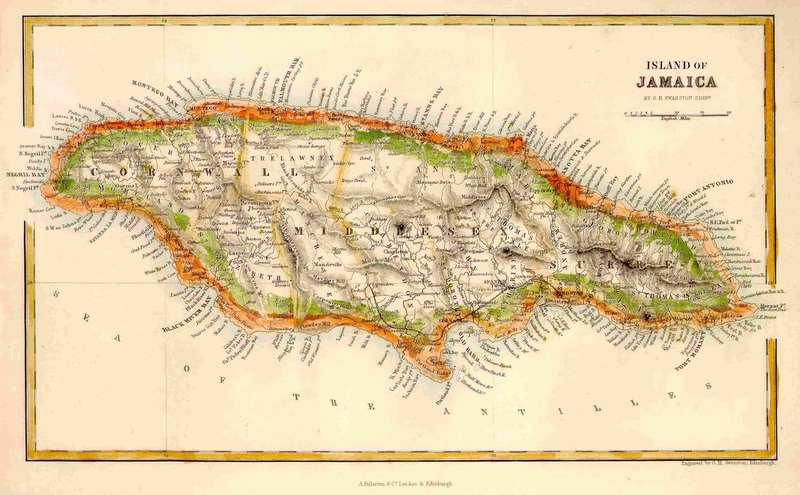 Yet Falmouth was a town that was proud of itself and thought little of Kingston; Trelawny held itself to be the first parish of the Island. It was very contemptuous of the city. We had heard that in Kingston the people [ate?] cucumbers, the little green vegetable which grew wild in our parish and which the boys used to pelt one another with. We had heard that they lived mainly upon rice cooked with pease, and that was enough for us to refuse to eat that article of food. We were quite convinced that our Court House was the finest building in the island: we knew that once we had threatened to rival the city as a shipping port. We lived on memories of that former greatness, and the assurance that we represented the old aristocracy and the old way of aristocratic living, on the belief Kingston was a place of parvenus, and that Trelawny and its chief town must some day come into their own again. Yet when Christmas came round we knew how to enjoy it; we spent it right royally, getting into debt to do so, could we but find anyone willing to allow us to owe them. Christmas lasted for several days with us; and when we learnt that in Kingston the people had a habit of flocking to the seafront to listen to a band which they could not hear, we laughed scornfully at their ignorance. For us, the old ways and customs were good enough. We ate prodigiously, drank much; at groceries and "doctor shops" our planters and overseers would assemble some days before the 25th of December to order supplies, treat one another to drinks, criticise the Government and joyfully proclaim the ruin of the country. And the townsfolk would arrange John Canoe dances, and Jacks-in-the-Green, and Cows, and Kitty-Flies, just as was done in Jamaica two hundred years before. My first memory of Christmas is associated with Kitty-fly, John Canoe, Jack-in-the-Green and Cow. I think I preferred Cow. It was a custom brought over from Africa at the very beginning of the slave trade: a man dressed himself in cow’s skin, covered his face with a mask, crowned the whole with a huge pair of horns and stuck a tail on that part of his body where, in the ages before man became man, he probably wore a tail. Accompanied by a crowd, some members of which shook a rattle and beat a drum, our Cow would parade the town, dancing to the horrible music made by his devoted followers. Kitty-fly, on the other hand, was dressed as a woman, carried a wand, wore a mask of “John Canoe face” and would also dance to the sound of drums. Kitty-fly had attending her other persons dressed somewhat like herself, and I believe that Kitty-fly was but the remnant and representative of the Set Girls that made Christmas so merry a hundred years ago. Jack-in-the Green and John Canoe I need not describe. They did not differ greatly from Cow and Kitty-fly. Some days before Christmas these bands would go about dancing night and day. While the sun was streaming down upon the open square which then formed the market of Falmouth, while the country people squatted over their little heaps of ground provisions, their cans of wet sugar, their trays of *butterdough (for which edible Falmouth was justly famous in those days): while the little shops and stores were still open, and their proprietors talking lazily to one or two friends (for nobody ever seemed to do any business in Falmouth): while in the dingy offices facing the sea the politicians of the town discussed the politics of the island (for Falmouth was always mightily political), the sound of drumming would be heard. It was Kitty-fly coming. Kitty-fly and her following, and no one saw anything incongruous in this exhibition in the daytime in a town of nineteenth century Jamaica. Cow did not make his appearance until after nightfall. At such times Cow would occasionally smoke a cigar, to the great scandal of us youngsters, who, being logical, held that it was impossible for a cow to smoke. I believe we really thought it was a real kind of cow that danced, a man cow, a man who could turn himself into a cow if he cared. I think the grown men and women of the peasant class thought so too, for whenever Cow made a dash at-the crowd, it would screamingly scatter in all directions, half pleased, half frightened. We were splendidly superstitious in those days; we firmly believed in Rolling Calves, Three-footed Horses, Old Higes and the other monsters of a terrified imagination, we were persuaded that a man could, if he wished, and had learnt how, transform himself into an animal. Hence we viewed with disfavour the smoking Cow. Cows never smoked. Our Christmas Cows, however, were usually half drunk, and so were, not always as careful of appearances as they should have been. From house to house these dancers would go, stopping before each to prance about - they called it dancing - beat their drums, laugh, sing, shout, and make a noise generally. All this was looked upon in good part by the better classes of the town, and no one thought of sending for a policeman. . . . These dancers - Cow. Kitty-fly and the rest - were encouraged by the gentry, who enjoyed their antics. They were given money freely. Christmas in our little northside town was a season when rich and poor came very near together, with the result that the poor enjoyed themselves as well as the rich. note: Kitty-Fly was 'a man dressed as a woman, wearing a mesh-like mask, and pantaloons with rows of embroidered edging'. Missa Rankine butter dough mus' sell. For Missa Rankine butter dough mus' sell.
. . . butterdoughs are an excellent food when eaten in moderation. No one who eats but a single butterdough can fully appreciate that delectable cake. But consume half-a-dozen and you discover its deliciousness and feel sick from over-eating. But now that butterdoughs are rising in price and becoming one of the luxuries of the rich, they can no longer be eaten freely. To a stranger, and in this instance it may be added, - judging from the assurances given us on all sides - to the oldest stagers of the parish the spectacle which presented itself on Wednesday last in the pretty and neatly kept little town of Mandeville, was interesting in the highest degree. It was the day on which was held the grand Christmas Market of the now fast waning year. According to Law, the hour fixed for opening the market is at 5 a.m. but with the lengthened experience of the present very courteous and pains­taking Lessee of that place of public resort, the gates were opened from 8 o’clock p.m. on the previous evening, so as to give more ready ingress to the seemingly never ending throng which from that hour, throughout the entire night, and up to 9 o’clock of the succeeding day, continued to pour into the town of Mandeville, bringing products and wares of the most diversified character, all to find eventual resting place and subsequent sale within the walls of the spacious and well ordered market. On came the people, from nigh and far, some from the Southern and other districts of Manchester, others from Clarendon and Vere, whilst a yet larger number found their way from the more distant parish of St. Elizabeth. At the hour last mentioned, viewed from the Court House which overlooks the town, the market was seen to be so densely packed with its living concourse of vendors and buyers, that it became a matter of surprise to imagine how the ever recurring numbers who yet sought admittance, were enabled to pass the turnstile and find entrance there. How would this have been possible, had the entire number of the vast multitude who came into the town for the purpose of attending the grand Xmas Market, sought admittance there at one and the same time. Large numbers of the people were congregated also on the parade outside and adjacent to the market, whilst the several stores were filled with busy visitors, engaged either in making sales of their coffee etc. or in effecting purchases from the well assorted and large stocks of dry goods, fancy goods, provisions and other merchandize, which are to be found in the neatly arranged stores of Mandeville. 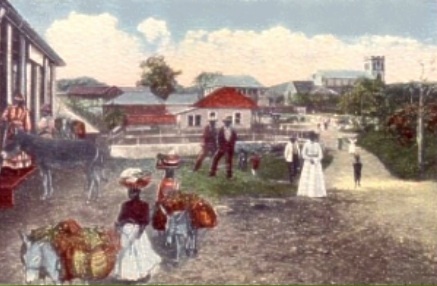 It was estimated by those well capable of forming an opinion that between five and six thousand persons came into Mandeville on this gala day and we leave our readers to imagine how novel and interesting was the sight on looking down on this sea of human heads from the windows of the building before referred to. Among this enormous gathering it was in no slight degree pleasing to mark the order which prevailed throughout, and to observe the tidy and cleanly attire of each successive individual we met. Early in the morning, from our comfortable temporary domicile - the Grove - the hum of these many mingled voices, reached our ears, the sound being somewhat akin to the buz which one can imagine would arise from the congregation in the distance of myriads of bees. When, however, we sallied forth for our morning walk, the sight which met our eyes was at once remarkable and impressive, increasing throughout the hours as the in-comers flocked to their point of destination. We believe from personal observation, coupled with information which we have been careful in gathering, we may state, that the Manchester peasantry are among the most prosperous and contented of their class. Their well-kept dwellings and in some instances the plots of ground which surround them give evidence of this, as likewise of the taste which rules with some of their owners, in their love of flowers which here and there may be seen either in boxes, or climbing the railings of the steps in front of their houses. 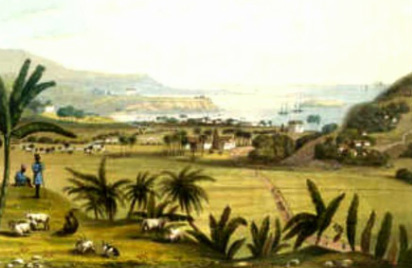 We have been assured on most reliable authority that some few years since - possibly six or eight, the number of cattle slaughtered in the Mandeville market was only two - and that very frequently a considerable portion of the second carcass had to be salted for lack of customers, besides these a couple of pigs would find sale. At the present day however, in proof of how greatly advanced as a beef-eating community are the people of Manchester, it may be stated, that no less than SIX head of cattle are killed and sold each Saturday, besides six or eight pigs, whilst on Wednesday another steer is slaughtered finding ready sale, besides the vending of mutton. On Wednesday the 24th inst. the large number of SIXTEEN head of steers were brought into the market, every pound of which found ready sale, as did TWENTY ONE hogs, of which two weighed 259 lbs. each. The heaviest steer killed, weighed thirteen hundred and fifty pounds, all the others be­ing in correspondingly good condition. It is worthy of mention here, that in the article of fine salt, besides the quantity sold in the shops of the town, no less than two and a quarter tons were likewise disposed of within the precincts of the market, 22 sacks of 2 cwt. each. Shortly after one o’clock however, whilst this large and busy gathering were in pursuit of their respective occupations or commissions which had brought them together, loud screams and lamentations were heard from persons who were seen hurrying across the Parade. Enquiry soon disclosed the fact, that an accident of a most uncommon but yet of a disastrous nature had occurred. The flooring of the store of Mr. G. H. MENTON situated to the East of and next to the Prison it was found had given way under the additional weight of the large number of persons therein assembled, who were effecting purchases. In less time than it takes for us to tell the unfortunate occurrence, the large and varied stock of provisions, spirits, wines, malts, etc., went down by the run to the depth of some twelve feet, into a cellar beneath the shop. Down, down also went the people who in the height of the terror which had seized them felt sure it was an earth­quake and that they were being swallowed alive. Quickly however did they find footing; some among them being nevertheless most awkwardly positioned by finding themselves wedged in between boxes, casks and barrels. Medical aid was promptly on the spot, as were the constables whose efforts were exerted to the utmost in endeavouring to keep off the enormous crowd which had by this time rushed from the market, placing ropes and chains around the premises. This was eventually accomplished, and the work of rescuing those who only a short time previously had imagined the end of the world had come was as promptly as possible got through, when happily, save a few bruises, no one was found to have been seriously injured. Pickled fish, flour, cornmeal, Kerosene oil, rum, wine, malt, coal, tar, pork, &c., were all heaped together in indescribable and mingled mass, and hard indeed must have been the heart which did not sympathise with the unfortunate man who had so suddenly sustained such heavy loss. On all sides did he receive assurances of sympathy, and it was cheering to observe how manfully he bore the sad disaster. Mr. Menton’s loss in stock is estimated at between three and four hundred pounds, to say nothing of the further loss which of necessity he must sustain in consequence of the temporary suspension of his business. The cause of the accident was attributable to the giving way of a brick pillar, erected many years since in the cellar as a support for the flooring, but which now proves on close inspection to have been originally built up with little or no mortary, red dirt or clay having been chiefly made to serve the purpose of mortar. Never before have we witnessed in this town, such a happy, pleasant, and joyful Christmas as 1884 brought forth, and we sincerely trust that the promoter of the whole of the amusements, the respected Superintendent of the St. Mary’s District Prison, may long be spared to repeat his noble and in every way successful effort to give wholesale amusement to all in Port Maria. Mr. William Speck was indefatigable in his exertions to amuse the great gathering and on this bright Christmas Morn our “Parade Ground” was decorated with huge trees, flags, and banners, bearing appropriate Mottoes, bannerets, orange trees, swings and a handsome Castle with “Welcome” over the archway, a greased pole on the top of which was a fine Ham, while over the River was another greased pole laid, with $5 in a handkerchief suspended at the end. The Race Course was a great attraction and no less than 11 Races were run for. The boys and young men who competed dressed in gay bright colours, gave a fitting charm to the scene. At 2 o’clock p.m., the sound of the bugle proclaimed the commencement of the sports, and by 4 the Parade was packed with Pedestrians, Equestrians and Coaches, while the happy smiles of Ladies and Gentlemen as also of the entire population present testified to the general pleasure felt by all. After the Races were run, many and many a shout rent the air as one after another the boys unsuccessfully attempted to reach the ham overhead, but when the trials on the river pole failed, and the poor fellows fell one by one headlong into the river, the climax was reached and laughter prolonged and loud rent the air in peal on peal, until at last one young fellow did get the coin. At a late hour the whole affair was concluded with a fine display of Fireworks, ending in the “Shower of Pearls” and as a hearty cheer burst from the lungs of the entire audience, there could scarcely have been a prouder or happier individual than our friend William Speck, to whom we are indebted for as enjoyable a Christmas as could be passed in Port Maria.